I think this is quite good but its strength is all in the reveals about Hellboy's real creation all the way back through time as a vision quest. If you don't mind just having him question his motives or reaffirm his chosen destiny versus being the bringer of the apocalypse, this volume is just fine. The art's interesting and the twists aren't unexpected, but it's still very satisfying. Africa. The tinkling of bells. Doomed mermaids. The Bog Roosh. Hecate. Davy Jones' Locker. Blasphemy and Inquisition. Atlantis, Lemuria, and Urr. The Watchers. The 32 words. Ogdru Jahad. The 369 Ogdru Hem. The Golden People. Hyperboria. Thoth. The Black Goddess. The Right Hand. The secret history of the world. And that's before we get to the eight pages of the original version of The Island, which is an homage to William Hope Hodgson.Any nod, no matter how small, to WHH has my immediate attention. When Mike Mignola does it, declaring his love of fungus people and throwing in rough sketches of the same, I'm totally on board, with big round red hearts for eyes.An excellent one-two-three punch of myth, mayhem, and Hellboy greatness. I've finished my re-read of the first five volumes and am moving on into new material--I've read a few scattered later volumes in the series, but this one was new to me. Two stories pick up where we left off in Conqueror Worm, with Hellboy leaving the B.P.R.D. and going off in search of...even he's not sure what, but it begins with him heading to Africa. I like the first story better than the second, mainly because the triad of the three mermaids' wishes is so poignant and so perfectly fairy-tale-like (the original fairy tales, not the children's versions that are famous now). Even so, both are excellent, and Mignola's description of the failed story "The Island" makes me hope he'll figure out a way to tell it someday. A return to the mysteries of Hellboy's origins and destiny, as Hellboy wanders after his departure from the BPRD. Hellboy's plain-speaking, cursing, and world weariness are present, as well as his adamant refusal to play by the rules of various gods and spirits and other beings. I've been making my way through the Hellboy trade paperbacks this week, and while I've really been enjoying them, this is the first one that I've felt the need to write a review for. I'm such a Negative Nelly that I'm speaking up because this is the first volume I've been disappointed in. In the intro to one of the two 2-parters that are in this volume, Mike Mignola promises that he's going to provide some origin stories for the Hellboy universe. I was looking forward to this, but the execution left much to be desired. This volume had Hellboy off on his own, having left the BPRD to do some investigation into himself. The downside of this is that it's left him without anyone to really talk to, and therefore all of the information is learned through a monologue of exposition. I would have preferred to have Abe or Liz or Kate or someone else there that Hellboy has emotional attachment to. The way that it was done, it just feels empty. The volume ends with him headed back to London, so hopefully that's the end of this complaint.I'm also a little fatigued from the many scenes where Hellboy is being knocked through the air and through walls and floors, but that's a minor complaint. I often want to offer him an aspirin, though. My favourite Hellboy collection so far. Loved this from start to finish. The first story, The Third Wish was just so sad, the ending is the closets to tears I have ever been reading a Hellboy story. Other than the emotional impact this story just had a lot going for it. It was fun seeing the African spirits reacting so violently to having the bringer of the apocalypses on their continent. And it was nice seeing the monsters of the world wanting Hellboy dead because they don't want the utter annihilation of the world. Yeah, they're horrible things that go bump in the night, but this is their world too, and they want it to stick around just as much as humanity does. The second story in this collection is The Island, which I enjoyed but found a bit confusing in some places. I liked that we get more back story to the creation of the Ogdru Jahad and why Hellboy's right hand is the only thing that can set them free. But there were some bits about Hellboy's blood I didn't get, and I have no idea how the big bad was killed, apart from the fact that Hellboy's blood had something to do with it (I think?). But even when I was confused, I was enjoying the story. Hellboy starts his journey of self-discovery and life re-evaluation after quitting the B.P.R.D., wandering to far-off lands to... well, to have more Hellboy adventures. But they are more deeply personal Hellboy stories than ever, once more focusing on Hellboy and his role in the foreseen apocalypse of which he, supposedly, will be the harbinger.Okay, so, this book is fantastic, from start to finish. From Mignola's deeply revealing introductions, to Hellboy's ever-so-charming "wisecracks" (if blurting out "son of a- !" and "geez!" can be said to be cracking wise), to the pages and pages of abandoned panels and concept sketches, this is classic Hellboy, with only a minute change in perspective providing a fresh narrative hook. There are two stories in this volume, a story taking liberal cues from Hans Christian Anderson's The Little Mermaid, and one that focuses predominantly on the origin of Hellboy's "right hand of doom," the world-burning ancient dragon Ogdru Jahad, and, weirdly (though perhaps fittingly), the universe itself. The first story is "The Third Wish," and, as stated, takes liberal cues from The Little Mermaid. Hellboy is wandering Africa, basically seeing where the winds take him, until he is taken in by a wise and very, very old witch-doctor, who soon ushers him into the sea, where he is kidnapped by a trio of mermaids and taken in by the Bog Roosh - a powerful sea witch, who plans to torture Hellboy, before cutting him asunder, and spreading his pieces over the globe, finally dissolving his right hand from existence, thus avoiding the predicted end of all things. Hellboy, trapped and helpless, is, of course, pretty grumpy about it. The key narrative focus of this piece is between the Bog Roosh and one of the three mermaids who assists in Hellboy's capture. She, as her sisters, makes a wish of the Bog Roosh in return for Hellboy, and she wishes for a blade that once belonged to her father, so she may honour his death. His father scolds her (as a phantasm, cos he's dead), deriding her decision to honour him, as he is dead, while Hellboy himself is alive - for Hellboy's life, she has chosen to "honour" the dead, and this is no honour. Hellboy is basically incapacitated and sweary the entire story, being told his inevitable fate as he grumbles a bunch, so the story is carried by the mermaid, as she struggles with the choice of what to do - save Hellboy, redeeming herself in the eyes of her father? Don't save Hellboy, and risk bringing forth the destruction of earth? She does, of course, opt to save Hellboy, but anyone who's read a Mignola story will understand that the tragic, sacrificial nature of her conclusion is all but foregone. The art is absolutely stunning, but, while this really doesn't have to be mentioned in regards to Mignola, there is an interesting visual hook which sets this story apart from even the most beautiful of those before it. The majority of the story takes place completely underwater, and the colours and shadows are so masterfully applied to empty, swirling vortexes of nothingness - it certainly creates a crushing atmosphere that is all at once claustrophobic and infinite in scope. And the Bog Roosh herself is stunningly portrayed, a creature of beauty and horror, one with absolute power and yet, in the face of Hellboy, hardly any at all - fearful and vengeful. She is so assured of her devotion to preventing damnation, Hellboy's escape is almost bittersweet, and it seems even Hellboy doubts whether he deserves release. It's a uniquely powerful take on a classic, dark fairytale, and I think it will be intimately familiar in tone to those who have followed Hellboy for this long.The next story is called The Island. Seemingly created in reaction to the Hellboy film, which was filming at the time this story was written (and features the Ogdru Jahad as a key monster), it focuses more intimately on Hellboy's role in the apocalypse - in particular the origins of the power that would see it through. Hellboy is drinking on a mysterious island, with a couple of newfound chums, as he recalls his close escape from The Third Wish. Soon, however, he is visited by the ghoulish presence of Hecate, the Queen of Witches, who beckons Hellboy to usher forth the End, as is his destiny. He refuses, of course. Oh, and it is revealed that he had been drinking with skeletons the whole time, which, naturally, pisses him off (though that doesn't stop him from skulling down another bottle of rum).This is a dense story; it has a lot of reveals, and it wraps up a lot of prior plot threads while opening up doors to new ones. Hellboy lore is heavy, but so much of it is based in actual mythology and folklore, and existing pulp literature, that it all seems to be almost excepted and common knowledge by this point. The origins of Hellboy's seemingly inescapable fate are detailed, in excruciating detail, in that specifically poetic prose of which Mignola is the modern master of; against his art's muted details and powerful blacks, the story is not so much grandiose as it is intimate. Add to that some bizarre and powerful imagery, such as the specter of a long dead priest reformed from Hellboy's own leaking blood, to the visage of the terrible dragon Ogdru Jahad itself, a hideous and fabulous beast which is rendered in all the magnificent and unholy horror the story implies of it. Questions are answered and asked equally, with the story ending, aptly, with a "The End...?" Considering it, on balance, is one of the least eventful Hellboy stories, its impact is spectacular - and its implications for our fearless hero are endless. To be honest, I thought Hellboy striking it out on his own for a whole volume would be dull, or perhaps outright boring. I should not have doubted Mike Mignola. The man remains to be one of the greatest living artists today, with clearly self-indulgent explorations of the elements of classical literature somehow coming together to make a new classic, a unique, if bleak, tale of a single man fighting against his future seemingly already written. Mignola always assures entertaining, humorous pulp roots and stylish, bombastic comic action cross paths with the prose of the 19th century masters, and this isn't a formula that has lost any of its steam yet - and probably won't for some time. Also, Hellboy tells of the time he ate "a banana from a haunted banana tree" and a ghost "hurled garbage" at him. Which, while an actual Cambodian folk tale, is made so very amusing from the fittingly dry and deadpan reaction it elicits from Hellboy. "Oh, geez," indeed. The stories are quite long but not a complete storyline. I honestly wish they kept these away from the main stotylines The stories are good and the artwork top notch just annoying its disconnection with other stories. 2017 Re-Read:Okay, so it took me a while to get back to my Hellboy re-read, but that's only appropriate since it took Mike Mignola several years at this point to get back to Hellboy himself. (The intervening period filled by other creators on Hellboy: Weird Tales.) This book represents Hellboy's "lost in the wilderness" years after leaving the BPRD and discovering that he still can't escape the weirdness that follows him around like a dog. In "The Third Wish" Hellboy finds himself a pawn in a dark, underwater fairy tale, and in "The Island" he gets the mother of all infodumps re: the origin of his Red Right Hand - information he'd rather not have been bothered with, thank you very much.This volume is Mignola at his Kirby-est and plays to all of his strengths - except that of producing new content on a timely basis. I love this book, but I'm also glad that after these stories Mignola turned the art chores over to others for a while, leading to a period of seriously increased Hellboy output. The first half of this volume, "The Third Wish," is outstanding. It has every element you hope to see in a Hellboy story, then adds mermaids. It begins Hellboy's journey to Africa, just scratching the surface of the continent's rich mythology, and sets off his search for meaning beyond his ancient destiny and beyond his association with the B.P.R.D.The second half, "The Island," doesn't work nearly as well. It's intended as an explanation of the "secret history of the world," but doesn't fit the exposition around much of a story. There are some nice reveals and stuff you assume will be important later, but it's an otherwise sub par effort. Although I must give it credit for one of my favorite Hellboy lines ever: "Don't mess with me, lady. I've been drinking with skeletons." I had collected all of the Hellboy tradepaper backs & am collecting them all again in the superlative library editions(especally since the Hellboy TPBs are infamous for pages coming loose afterva while)since there thee greatest modern comic & mabye the greatest line of comics ever & this trade gets 5stars just like all the other red fella books I've read.ps-for anybody just starting to collect Hellboy books GO WITH THE LIBRARY EDITIONS,the oversized artwork is superb & the quality of the books in general are just as good,price wise superior to the DC ABSOLUTE editions! I'm basically giving this entire collection five stars because the mermaid story was so excellent, I want to give it ten. One of the best tales of the fantastic I have ever experienced, in any format. Mignola really gets myth and how to write it in a way that so few storytellers do. Plus the art is stunning throughout. This is definitely worth a read--even if, like me, you have only read a couple other Hellboy collections. 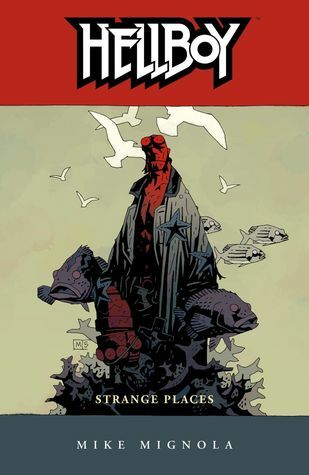 I like the art, love the Hellboy character and enjoy Mike Mignola's introductions to the stories, but overall, I wasn't thrilled with this volume. Too much yap yap yapping from the baddies and not enough snappy lines from Hellboy to provide some comic relief. It was all pretty heavy this time around, and I just wanted everyone to shut up already. I absolutely loved the first story in this collection, The Third Wish, because of the mermaids. I loved the take on The Little Mermaid (Anderson version, not Disney). The entire story just worked on every level for me. The second one, The Island, gets bogged down with exposition and theosophy. Still, it's perfectly illustrated, just like The Third Wish. Another strong entry in the Hellboy oeuvre.More supernatural creatures, more dead, more strange places. Great art, feel, and atmosphere. If only Mignola could write dialogue a little better...Nothing wrong with this one at all, but 2 days later, nothing stands out as amazing. But when you're this consistent, that's OK. This collection of Hellboy contains two stories and they were a mixed bag. I loved the first story involving Hellboy under water dealing with another witch and her plans to kill him. The story was amazing and Mignola's art in the underwater scenes was spectacular. The second story I didn't care for. I actually enjoyed the penciled pages that weren't used for it more. I think the idea just got away from the creator. Too many ideas in one simple story can overwhelm it. Overall, the book was good but the highlight was definitely The Third Wish. Another great one by Mignola. I love these comics.It's amusing to me that I avoided these for so long because I wasn't fond of the character (or the art). But as I read through them, I realize that Hellboy is just a catalyst; a means for Mignola to rewrite (update?) and draw all of man kinds folk lore and mythology. I say again, I love it. A necessary step in the journey of Hellboy, this volume spends a lot of time talking about prophecy, and not enough time making an intriguing story. If you're already ensconced in the continuity, it's a little slow, but if you've never picked up a Hellboy book before, I'm guessing you would not pick up another after you finished reading this. This is the book where Hellboy strikes out on his own and goes to Africa. It is the beginning of the rest of his story and destiny. It is helpful if you have read the rest of the series. This is the first volume in the series that needs a bit of the history. It still stands on its own but is rich only when you consider the rest of the material. This was a mostly mediocre volume until the last section where we get a ton of payoff and a magnificent creation myth. This series is going places, and here we start to get a lot more long-term development not only for the series mythology but HB's growth over time. Пригоди Хелбоя під водою.Все на висоті , читати варто! am i including this simply to get my count up? why yes, yes i am. Visually stunning as usual but the story just didn't capture me as much as others have. That tends to be my experience with the volume long stories. Good but not as good as I remember it being when I was in my teens. Life scars us and makes everything lesser the second time around. Loved "The third wish" tale. Mignola at his finest. Mike Mignola - Mike Mignola was born September 16, 1960 in Berkeley, California and grew up in nearby Oakland. His fascination with ghosts and monsters began at an early age (he doesn't remember why) and reading Dracula at age 13 introduced him to Victorian literature and folklore from which he has never recovered.In 1982, hoping to find a way to draw monsters for a living, he moved to New York City and began working for Marvel Comics, first as a (very terrible) inker and then as an artist on comics like Rocket Raccoon, Alpha Flight and The Hulk. By the late 80s he had begun to develop his signature style (thin lines, clunky shapes and lots of black) and moved onto higher profile commercial projects like Cosmic Odyssey (1988) and Gotham by Gaslight (1989) for DC Comics, and the not-so-commercial Fafhrd and the Grey Mouser (1990) for Marvel. In 1992, he drew the comic book adaptation of the film Bram Stoker's Dracula for Topps Comics.In 1993, Mike moved to Dark Horse comics and created Hellboy, a half-demon occult detective who may or may not be the Beast of the Apocalypse. While the first story line (Seed of Destruction, 1994) was co-written by John Byrne, Mike has continued writing the series himself. There are, at this moment, 13 Hellboy graphic novel collections (with more on the way), several spin-off titles (B.P.R.D Lobster Johnson, Abe Sapien and Witchfinder), three anthologies of prose stories, several novels, two animated films and two live-action films staring Ron Perlman. Hellboy has earned numerous comic industry awards and is published in a great many countries.Mike also created the award-winning comic book The Amazing Screw-on Head and has co-written two novels (Baltimore, or, the Steadfast Tin Soldier and the Vampire and Joe Golem and the Drowning City) with best-selling author Christopher Golden.Mike worked (very briefly) with Francis Ford Coppola on his film Bram Stoker's Dracula (1992), was a production designer on the Disney film Atlantis: The Lost Empire (2001) and was visual consultant to director Guillermo del Toro on Blade II (2002), Hellboy (2004) and Hellboy II: The Golden Army (2008). He lives somewhere in Southern California with his wife, daughter, a lot of books and a cat.